Apple lately bypassed the 4K UHD trend and jumped straight to 5K with its latest iMac. The fancy new 27-in desktop is anything other than a dramatic breakthrough in desktop computing, boasting an impressive display with a 5,120-by-2,880 resolution packing an unheard-of 14.7 million pixels, which is 7 times the number of pixels on HD TV, putting ultra-high definition screens to shame. So it's reasonable to want to watch movies and TV shows on such a high-definition screen. 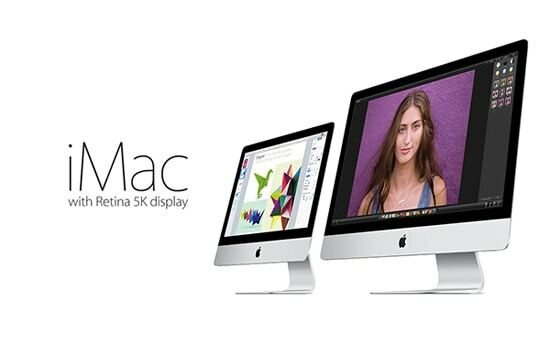 Here in this article, you will be informed of everything about the 5K iMac, and how to play HD video on iMac 5K retina display, be it 4K/8k UHD video or 1080P video in MKV, MTS, or AVCHD format. 5KPlayer - Tailored video player to play 5K, 4K, 1080P HD, 720P videos on iMac 5K Retina display with H265/HEVC codecs supported. No matter they formatted with MTS MKV AVCHD or MP4 MOV AVI, videos can be played with sharp image. Retina 5K display is a brand name used by Apple for screen that has a 5,120-by-2,880 resolution, which differs distinctly from the previously known 4K Ultra HD resolution. The main difference between 4K and 5K is that a 4K display has a resolution of 3840*2160 with aspect ratio of 16:9 or 4096*2160 for 19:10 while a 5K display has a 5120*2880 pixel resolution at a 16:9 aspect ratio. Generally, it's great to play ultra HD 4K video on a 5K iMac display as you can view all of the images at their true native 4K resolution. The Retina 5K display, coupled with AMD Radeon R9 M290X graphics card, quad-core Intel Core processor and more high techs, makes pictures and videos show in higher resolution and smoothly. So how will the iMac 5K perform when playing ultra HD videos. On full 4K resolution 3,840x2,160 resolution test pattern, according to CNET review, the new iMac showed excellent detail among the delicate branches when playing a native 4K Ultra HD video clip. So the 5K display on the 27-in iMac makes it sufficient to play ultra HD video, though it is still hard to find. What about playing regular old HD 1080P videos on iMac 5K compared with other platform with ordinary display? Test also indicates that 1080P high-definition video watching experience is stunning, with everything on the 5K screen looking sharp and natural. The 1080P video, known as Full HD video with a resolution of 1920x1080, is one of the most popular video types in the market. Whether you are watching films, TV shows on YouTube, Netflix, playing movies on your mobile phone, or recording personal shots with camcorders, you can easily get in touch with the video contents in 1080p. but when it comes to Ultra 4K HD video, such source is rare. The good news is Sony offers feature films, movies , short-form videos and TV shows in native 4K Ultra HD resolution for download to consumers by courtesy of the 4K Ultra HD video download service. Besides, YouTube, Netflix, Samsung and Amazon also let users who have 5k iMac watch 2160p HD videos with no hassle. MacX Video Converter Pro - World's No.1 fast to convert videos in any format (MKV, MTS, MOD, AVI, WMV, MP4) or resolution (4096p, 2160p, 1080p or lower) to iMac with 5K or 4K display, 5x faster than competitors. No quality loss. Like many Mac platforms Macbook Pro, Macbook Air, Mac Pro, etc, the new iMac 5K only recognizes a limited video formats such as M4V, MOV, MP4. For the 1080P HD videos, which are commonly seen in HD camcorders, with a format extension .mkv, .mts or m2ts, it will fail to play them. Worse still, even though you can easily find some 4K videos stored in MP4 format that is said to be compatible with a large number of devices. But things are quite different as such type of content is accompanied with different codecs, resulting in failure in playing high-definition videos. So you are urged to convert the HD MKV MTS M2TS AVCHD videos to 5K iMac for a smooth playback of the HD videos. HD video converter is the ultimate 4K/8K HD video converter that is able to convert any videos to for playing on its 5K retian display. Follow the guide to make 8K/4K/1080p video playable on iMac 5K's high-definition screen with optimal quality. MacX Video Converter Pro, regarded as the best 2016 Mac video converters, is bound to be your best aid to transcode, compress and convert videos, including 4K/80 UHD and 1080p/720pHD videos, for the new iMac. Through constant upgrade, it works flawlessly on Mac OS X, including the Yosemite, El Capitan (10.11) and the latest macOS Sierra. 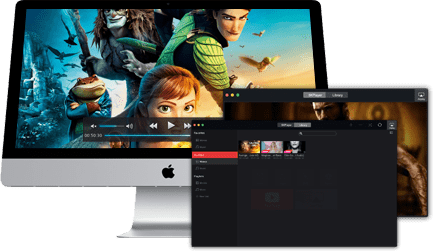 That's to say, no matter you are running on Macbook Air, MacBook Pro or the new 5k screen, iMac 4K, the HD video converter conducts the transcoding from HD MTS, M2TS, AVCHD, MKV videos to Mac supported format on these platforms without any hassle. It makes 8k 4K 1080P HD video conversion world's fastest speed by courtesy of the reworked encoding engine, the multi-core CPU, the hyper-threading technology and Intel QSV supported. 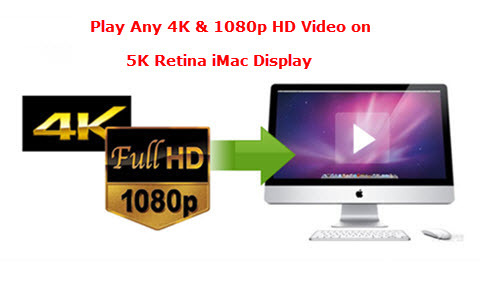 And you are guaranteed to play HD video on iMac 5K with no quality loss thanks to its high-quality engine. Here we take converting HD MKV video to iMac with Retina 5K display accepted MP4 format as an example. Step 1: Free download this video converting software and fire it up. Click "Add File" button to import the source HD video after you free download, install and run the HD video converter. 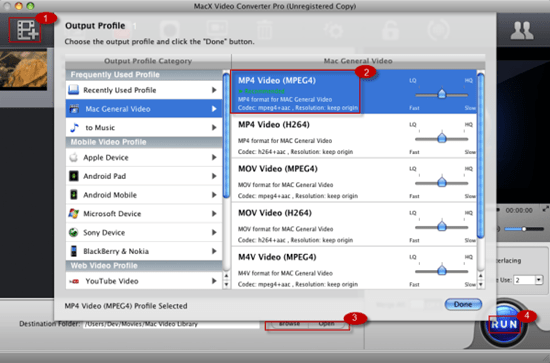 Step 2: Go to "Mac General Video" from the drop-down window and choose "MP4 Video" as the output format. Step 3: Click "Browse" button in output setting area, select a destination folder in the dialog box that opens, and then click OK. Step 4. Click "RUN" button to start the conversion from MKV to MOV that can be played on the 27-inch iMac with 5K display. Convert any AVI MP4 WMV and other videos: Except from converting HD multi-track MKV MTS AVCHD Videos to iMac 5K readable format, this 5K video player also enables to convert other mainstream videos like AVI, MP4, WMV, FLV, 3GP, WebM, and more to MP4, MOV or M4V format that is playable on 5K iMac, as well as other media players or video editors. Download YouTube video: The built-in YouTube downloader allows you to even download YouTube video on iMac 5K, making you easily play YouTube FLV video on the 5K resolution display. Besides supporting the latest Mac platforms, it performs well compatibility with other Apple devices as well as Android gadgets, including iPhone (7/7 Plus), iPad Pro, iPad (Air 2, mini 4), Apple TV (4), Samsung Galaxy Note series/S7 edge+/Tab S, etc.